Thank you to everyone who came by to shop the sale! It was my best sale ever and I want you all to know how much I appreciate your support! 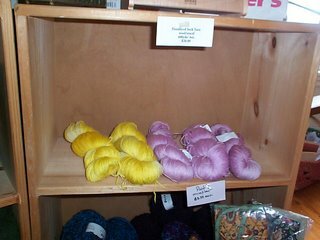 There are a number of shelves where a few lonely skeins huddle together wondering where all their friends went (that shelf was full last Wednesday!). Needless to say, I'm going to order a bunch of stuff this afternoon, some of which will be sock yarn. Look for it in the shop and listed on Etsy by the end of the month. Now it's time to block some lace! 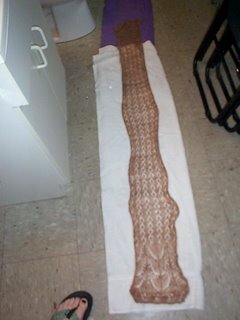 When you finish knitting lace, that’s only the first part. The most important (and gratifying) part is the blocking. I’ve tried blocking lace a number of ways and, though most of them have worked well, they have all been really time consuming. 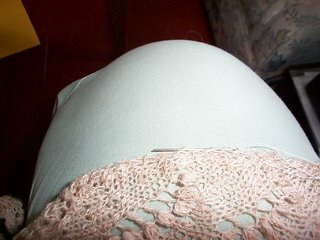 This time, I am trying pinning it out. Since I don’t have a rug or a spare bed to do this on, I went to Home Depot (expecting to see Grumperina any minute) and got a piece of ¾” foam insulation. I had to cut the end off to fit in the car but what I had left was plenty. If you decide to ever use this method, be sure to wash off the insulation before you start. Home Depot is full of many nifty things but it is also full of dust! I can’t believe how dirty my hands were when I got home. 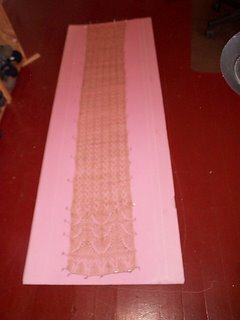 This is straight edged lace so I ran a thread down each side to save pins and avoid making the edge wavy. The end is actually supposed to be wavy so I just pinned the points. The next step is to soak the lace. 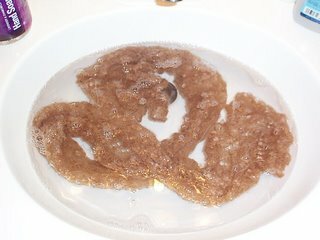 The Yarn Harlot seems to like to soak stuff for a while just to show it who’s boss. I am not as patient and only soaked this for about five minutes. When I took it out, I rolled it in a couple of towels (one wasn’t long enough) and knelt on it to really give it a good squish. It is amazing how much water 2 oz. of lace can hold! The last step is, of course, the pinning, which went relatively quickly. It was really cool how the wavy edge straightened out when I pulled on the threads! I’ll definitely use that technique again. The ends are not as wavy as they are meant to be. I bound off too tightly which is really bizarre for me. I’m some kind of freak of nature in that I almost always bind off too loose. Ah, well, too late now. I’ll remember it for the next time. All in all, I’m pretty happy with the results. This is my first time knitting lace from my own handspun and I’ve enjoyed the experience. I’ve actually started spinning some cashmere for next year! holy crap- that's beautiful! 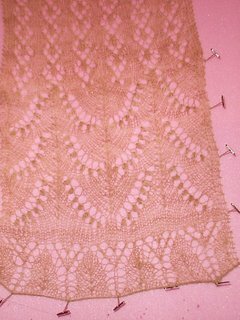 and i'm psyched to have instructions for blocking lace, in case i ever decide to finish my ufo lace wrap. I used to use foam insulation too although mine seemed to be more rigid than yours and was a bugger to store away! I recently purchased those "jigsaw puzzle" like interlocking foam blocks from a toy store (I have seen them at Wally's Mart too) for less than $20. 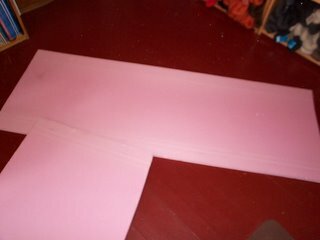 There were 4 in the pkg and they are each 2' square. 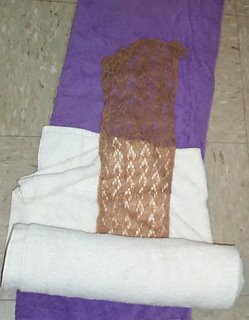 Much easier to hide away when not in use and when you don't need a large piece (for blocking smaller items) then you only need to pull out 1 or 2 of them. Your lace is lovely btw.!! and glad your sale was successful! Susanne, thanks for the great idea! I've been wondering where I 'm going to store this thing and those blocks seem like they'd hold up better with repeated pinning. Look at all that lonely lemon drop! I'm glad I gave a skein a good home. Look for it's resurrection as a pair of socks sometime in the (hopefully) near future.